surround your baby with the high safety standards and thoughtful design that Baby Jogger is famous for. City GO base includes both a LATCH system and a built-in belt lock off. TaxiSafe™ Belt Path allows you to thread a vehicles 3 point seat belt around your car seat. Large 3-panel UV 50+ canopy will throw a lot of shade to help protect your baby from the sun’s rays. At only 8 lbs. the City GO infant car seat won’t weigh you down whether you’re using it as a carrier. Safety - With a secure 5-point harness, EPS energy absorbing foam and superior impact protection from all sides, the City GO meets and/or exceeds all US Safety standards so you can travel with a little more peace of mind. Easy Installatioin Our ClickSafe™ base with a bubble level indicator offers easy, secure installation and the City GO base includes both a LATCH system and a built-in belt lock off to provide a secure installation in vehicles without LATCH. TaxiSafe™ Belt Path Our TaxiSafe™ Belt Path allows you to thread a vehicles 3 point seat belt around your car seat (European Style) to keep your baby safe and secure in rental cars and taxis. Canopy Whether you’re riding in the car or strolling along, our large 3-panel UV 50+ canopy will throw a lot of shade to help protect your baby from the sun’s rays. Comfort Soft cozy fabric, a plush padded seat and a quilted head cradle will keep your baby comfortable on the road while a removable preemie insert is included to keep the smallest of passengers safe (4 lbs and up). GO anywhere At only 8 lbs. the City GO infant car seat won’t weigh you down whether you’re using it as a carrier, a car seat or a travel system. Make it a Travel System The City GO infant car seat can become a travel system in a heartbeat using many Baby Jogger strollers. Simply snap on the adapter brackets and youve got a customized travel system for your infant. (car seat adapter and strollers sold separately). 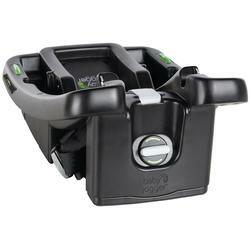 The Liquid holster uses a self-leveling mechanism to prevent unwanted spills when strolling. It securely fits most tubing as well, so its not just for your stroller! Restrictions: Do not use with hot liquids. The Baby Jogger Rain and Wind canopy is custom designed to fit each model of Baby Jogger stroller. This accessory completely encloses the front and sides of the Baby Jogger stroller while providing ventilation.